The results are in! Recently, we surveyed 180 enterprise companies using one or many conferencing technologies for their business. Survey questions focused on understanding user adoption and measurement barriers. The results have been analyzed by our experts, and placed into a handy report just for you! Spoiler Alert! It’s likely you’re encountering a hefty disconnect. 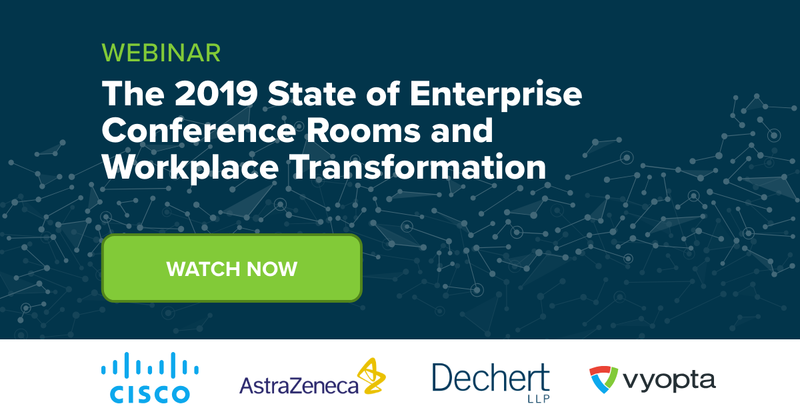 Although 66% of enterprises felt setting goals for video conference usage and adoption was critical to success, they’re not able to hold their end-users accountable. Since Vyopta is the business of monitoring each of your video collaboration technologies within a single system, we’re pretty in-tune with market trends. If you weren’t aware, the use of video collaboration tools in business is on an upward swing. Yes, big changes are happening in the video conferencing market, it’s all very exciting. However, if things are moving so quickly, enterprise businesses could be struggling to keep up. For instance, if companies are adding new business collaboration tools on top of legacy solutions to help streamline operations, improve their customer experience, support their product, etc. at a rapid rate, there’s likely little time to strategize. Providing comprehensive training for staff, setting meaningful goals and measuring the adoption and use of newly implemented technologies can prove challenging. Sound similar to what you’re hearing around the water cooler? This idea is nothing new. We asked very pointed questions around adoption of video conferencing tools in our survey. It was no surprise to find that 66% of survey respondents felt setting adoption goals was important. What was eye-opening was learning that 80% of the survey respondents indicated they are not held accountable to adoption goals. Woah, hold the (video) phone! This was a major disconnect. If goal setting is important, but companies are not being held accountable – we have a problem. How can businesses show their users the full advantages of video conferencing without clear accountability? How can you increase video conference calls in your company without goals and a subsequent strategy? Although there could be several reasons for this, many survey respondents indicated they simply so not have the tools to measure their video conferencing solutions effectively. Some survey respondents indicated they do not monitor usage at all, while others didn’t feel confident in the insights they produce via manual data extraction and reporting. Enterprise businesses are encountering what we call a “barrier,” a few barriers actually. They need the means to provide an accurate picture of video collaboration adoption and performance so they can hold end-users accountable, reach their goals by increasing video conference call usage, and get the return on investment they expected from their network solutions. Luckily, we’ve developed a winning adoption formula (and a comprehensive analytics tool) to help. Take a peek at our latest report to learn more about our survey findings, and what actions you can take to improve your video conferencing adoption rate – fast!